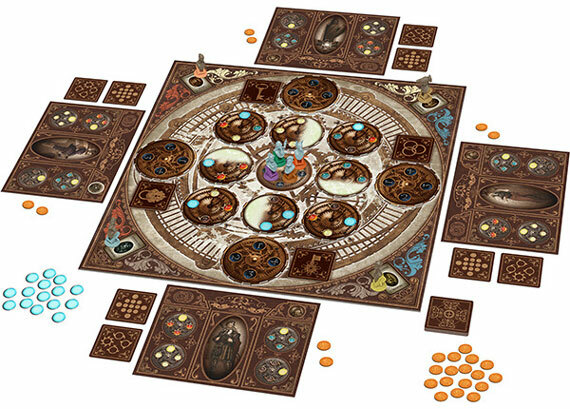 Set in the fantastic steampunk World of Smog created by Panache Animation, On Her Majesty's Service is a stylish board game for two to four competing players. You'll need to navigate the rotating tiles that make up the game board, trading Ethers and Artefacts in order to fulfil the quest set by Queen Victoria, all the while dealing with the Agents of the Shadow Master. Each player controls a different Gentleman, tasked by Queen Victoria to journey into the Shadow Market and bring her four precious Artefacts. To do so, they'll need to navigate the underworld of shifting gears that is the Shadow Market, buying and selling the different Ethers in order to have the Coins necessary to acquire all four of the Artefacts. One unique aspect of On Her Majesty's Service is that each player may only interact with the icons that are facing their edge of the board. Since the tiles that make up the board are frequently rotated by the players' actions, the landscape of options available to each player is in constant change. Manipulating the board to one's advantage (and to hinder your opponents) is crucial to victory. Gathering the different Ethers (mana, blood, titanium and ectoplasm) is also essential to allow the players to activate the powerful Special Action cards they can gain. And more importantly, once they've acquired all four Artefacts, they'll need to have the right amount of each Ether to match their Secret Combination in order to be allowed to leave the Shadow Market through their Secret Gate. Thus, choosing what Ethers to buy and when to sell them is a key factor to making sure your whole plan lines up. The Gentlemen are not alone in the Shadow Market, however. The Agents of the Shadow Master rule this place, and each of them has a different ability that often hinders (but may sometimes aid) the Gentlemen's progress. Players can pay a tribute to the Shadow Master in order to gain his favour, allowing them some control over the Agents' actions. Jogando Offline accepted the Queen's challenge and sat down to try out the game. As with almost all Cool Mini or Not games this one is pure gold when it comes to product quality. The artwork is excellent, the components are even better. The rulebook is easy to follow and if that’s not enough for you, get over to Watch it played and they will let you know how its done. The queen have sent you and the other players to a mystic market run by the feared shadow master and his agents in order to get four artefacts. To do this you have to manipulate the board, bribe the shadow master and backstab the other players. The game is quite fast played, not much downtime and still there is some strategy involved. The board is what makes this game special. 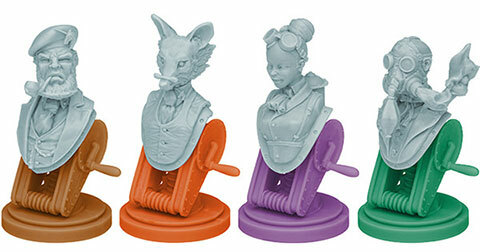 What you pay for ethers and artefacts is depending on your position on the table and change during gameplay when players turn the rotating gears on the board. While it’s best played with four players it’s still fun with two or three. The game is gorgeous to look at and more fun to play than I first thought it would be. Well worth its price! In a party board game weekend on a friend’s house I saw the box of “The World of Smog: On Her Majesty’s Service” ( short name Smog ) that have a beautiful art and inside have gorgeous components, the manual have that theme steampunk and alter past with a great story to my Smog become my new favorite game. In the game you are a gentleman on Majesty’s service, with the mission of obtain four powerful and magic objects in a shadow market on another dimension and obviously return alive. Is easy to learn although the eight actions you could do, but only three per round, basically is move across the market, buy or sell materials, or artefact, also rotate the title. And to do more interactions there are shadow agents with different effects to the affect the players or the table. The table is very important because where you sit affect the cost to buy and sell (the bottom value, as how you view), there are cards to move (rotate) the entire board, really funny. All steampunk lovers must have this game, also if you like abstract games. I’m trying to find contras to this game but I can, therefore I wish to have the kickstarter version, with more cards, more agents, and especially the whole boby minis. 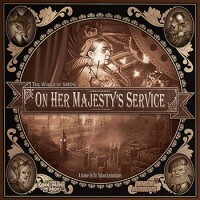 Add a Review for "The World of Smog: On Her Majesty’s Service"